can we download the photos? Permalink Submitted by rene chiu (not verified) on Tue, 2009-10-20 11:34.
thanks for your helpful information and photos in details and very useful to help with my school history project. other than the photos linked to flick web, can i download the photos of your web hosted in the flash setting? can i have the links to download the photos? re: can we download the photos? Permalink Submitted by David on Tue, 2009-10-20 21:55. Thanks for writing in. You're welcome to use the photos here in your school project. Please quote gwulo.com as the source of any photos you use. Unfortunately there isn't a link to the original photos, so the easiest approach is to make a screen capture ('print screen'), then edit and paste into your document / presentation. What is the subject for your school history project? Maybe you can post up a copy of the finished project for us to see? Permalink Submitted by SanderB on Mon, 2017-06-12 19:10. On Wikipedia, there is another picture from the same point of view. Anyone who knows who the two men and one woman on the right are? Maybe actors, since this building is the World Theater, I guess? Permalink Submitted by moddsey on Mon, 2017-06-12 20:46. Yes, that's the World Theatre. Chinese film advertisements. Permalink Submitted by breskvar on Tue, 2017-06-13 00:19. The information says one of the stars in this film is actor Chao Fei Fei, who was active in Hong Kong from the 1920s to 60s. A google search reveals every picture of him featuring a moustache, see below for a picture I found taken in 1955. The left hand side portrait in this photo is a man with a long face and a 'stache. Does it look like him? The lead actress of this film is Wu Tip Ying (胡蝶影). Don't know if it's the person in the middle portrait. The clothing of the pedestrians though do make this photo look pre-war, so a good 15 years earlier than the 1950s view at least. Permalink Submitted by SanderB on Tue, 2017-06-13 19:40. Thank you all for this great input. However, on the chronological overview of the history of Hong Kong Tramways on Wikipedia, the notion is made that only in 1949 a double-track system has gone in use. Doesn't this picture show a double-track system as well, as there is one track for one direction and anonther for the poosite direction? And is this an open-top tram or an enclosed double-decker? Thank you in advance. Permalink Submitted by breskvar on Tue, 2017-06-13 19:56. On the picture you posted yesterday, there is only one set of tracks for one tram to go through at a time. The angle of the picture is not able to shed light on whether there is another set of tracks. In contrast, in the 1950 photo there are clearly two sets of tracks for two trams to travel in opposite directions at the same time. Permalink Submitted by moddsey on Tue, 2017-06-13 20:49. 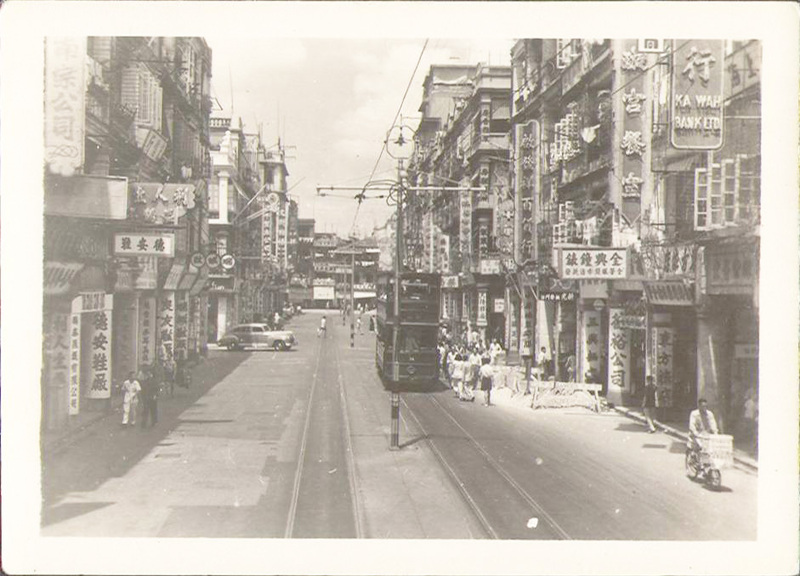 This part of Des Voeux Road Cental has always been double-lined with tram tracks since 1904. This is an enclosed double-decker tram. Permalink Submitted by SanderB on Tue, 2017-06-13 22:37. Thank you for your reply. Does this mean that the attached picture would date from before 1904? I would date it around 1935 because of the flags and the Peugeot/ Mercedes/ Bentley? Permalink Submitted by moddsey on Tue, 2017-06-13 23:51. Suggest to view the scenes along the tramlines from the 1950s and tramlines map from 1954. Permalink Submitted by breskvar on Tue, 2017-06-13 23:54. You may well be right about 1930s. It is not possible that this picture dates from before 1904. Trams in Hong Kong started in 1904, so the tracks will tell you it must be after that. Also, the Republic of China flag indicates it must be after 1911. Of course, the car probably is a better indicator of the age of this photo. Permalink Submitted by tngan on Wed, 2017-06-14 00:53. That might fit as until Tram Co move the east-west spit fork Morrison Street to Des Voeux Road, there was really a single west bound trek between Mirrison Street and Clevery Street. The crowd on the left hand side might as well be the junction of Clevery and Des Voeux. Permalink Submitted by SanderB on Fri, 2017-06-16 01:45. Thank you all for this incredibly interesting input. You might indeed be right about the tram rails in the background of the photograph. 1950s seems a little late to me, but I have contacted AutoWorld (the Belgian vintage car museum) to ask if they have any more information on the car, to have a more precise date. I will keep you posted. Permalink Submitted by moddsey on Fri, 2017-06-16 06:35. A photo of the captioned area showing the single tram track. Some of the signboards in the photo below match the signboards in the photo above which I date from the late 1940s to early 1950s.